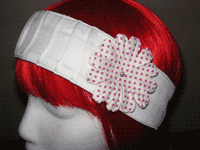 Fabric headbands are hand-made in the USA. One size fits most. Satin headband with gold chain link and Austrian Crystals. Tangerine or Taupe. Bright rhinestones interlaced with satin. Headband. Ivory/Clear, Red/Clear. Satin polyester 4" bow with gold medallion accent. Creme/Black, Red/Black. Understated elegance in White satin. 1/2"w headband. 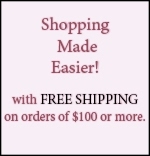 Also in Black, Ivory, Lilac, Mint, Pink, Silver, Sky Blue, Yellow. 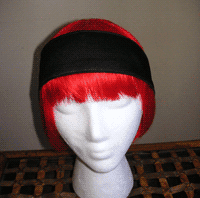 Extra wide headband, adjusts for more styling options. Cocoa brown Lycra. Adjustable 2"-5" w.
The pride of the peacock. 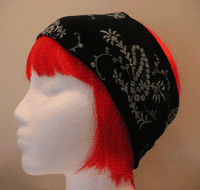 Black satin headband with colorful cascading peacock feathers. Hand made. Versatile frills of white/black dotted organza flow beautifully. Wear with festive or casual attire. Hand made. Black satin double-headband, with sleek lucite and rhinestone detail. Genuine leather head wrap has wispy feathers suspended from braided chain. Kite White, Brown Sparrow, or Raven Black (not shown).